For the brother of King Frederick II of Prussia, see Prince Henry of Prussia (1726–1802). For the brother of King Frederick William II of Prussia, see Prince Henry of Prussia (1747–1767). Prince Albert William Henry of Prussia (German: Prinz Albert Wilhelm Heinrich von Preußen; 14 August 1862 – 20 April 1929) was a younger brother of German Emperor William II and a Prince of Prussia. He was also a grandson of Queen Victoria. A career naval officer, he held various commands in the Imperial German Navy, eventually rose to the rank of Grand Admiral and Generalinspekteur der Marine. Born in Berlin, Prince Henry was the third child and second son of eight children born to Crown Prince Frederick (later Emperor Frederick III), and Victoria, Princess Royal of the United Kingdom (later Empress Victoria and in widowhood Empress Frederick), eldest daughter of the British Queen Victoria. Henry was three years younger than his brother, the future Emperor William II (born 27 January 1859). He was born on the same day as King Frederick William I "Soldier-King" of Prussia. After attending the gymnasium in Kassel, which he left in the middle grades in 1877, the 15-year-old Henry entered the Imperial Navy cadet program. His naval education included a two-year voyage around the world (1878 to 1880), the naval officer examination (Seeoffizierhauptprüfung) in October 1880, and attending the German naval academy (1884 to 1886). As an imperial prince, Henry quickly achieved command. In 1887, he commanded a torpedo boat and simultaneously the First Torpedo Boat Division; in 1888 the Imperial yacht SMY Hohenzollern; from 1889 to 1890 the second-class cruiser SMS Irene, the armored coastal defense ship SMS Beowulf, and the capital ships SMS Sachsen and SMS Wörth. From 1897, Prince Henry commanded several naval task forces; these included an improvised squadron that took part with the East Asia Squadron in consolidating and securing the German hold on the region of Kiaochow and the port of Tsingtao in 1898. The prince’s success was more of the diplomatic than the military variety; he became the first European potentate ever to be received at the Chinese imperial court. In 1899 he became officially the commander of the East Asia Squadron, later of a capital-ship squadron and in 1903 commander of the Baltic Sea naval station. From 1906 to 1909, Henry was commander of the High Seas Fleet. In 1909, he was promoted to Grand Admiral. At the beginning of World War I, Prince Henry was named Commander-in-Chief of the Baltic Fleet. Although the means provided him were far inferior to Russia’s Baltic Fleet, he succeeded, until the 1917 Revolution, in putting Russia’s naval forces far on the defensive, and hindered them from making attacks on the German coast. After the end of hostilities with Russia, his mission was ended, and Prince Henry simply left active duty. With the war’s end and the dissolution of the monarchy in Germany, Prince Henry left the Navy. Waldemar William Louis Frederick Victor Henry 20 March 1889 2 May 1945 Married Princess Calixta of Lippe-Biesterfeld, but had no issue. William Victor Charles Augustus Henry Sigismund 27 November 1896 14 November 1978 Married Princess Charlotte of Saxe-Altenburg, had issue. Their sons Waldemar and Heinrich were both hemophiliacs, a disease which they inherited through Irene from the maternal grandmother of both of their parents, Queen Victoria, who was a carrier. Medallion designed by Victor David Brenner for Prince Henry's 1902 visit to the U.S.
Henry had little in common with his brother, the German Emperor. He lacked, for example, William II's erratic nature and egotism. 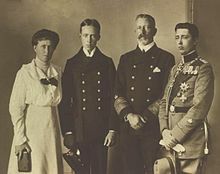 Contrary to popular belief, the kaiser and the prince were both truly popular in Germany, and on account of his humble and open manner, Henry was beloved by those under his command. On foreign travels, he was a good diplomat, who, unlike his brother, was able to strike the right tone. Thus, on his 1902 trip to the United States, Henry made a favorable impression with the critical American press and succeeded in winning the sympathy of more than just the numerous German-American segment of the population. As a naval officer, Henry had a profession that completely satisfied him and that he loved. He was thoroughly a pragmatist. He received one of the first pilot’s licenses in Germany, and was judged a spirited and excellent seaman. He was dedicated to modern technology and was able to understand quickly the practical value of technical innovations. A yachting enthusiast, Prince Henry became one of the first members of the Yacht Club of Kiel, established by a group of naval officers in 1887, and quickly became the club's patron. Henry was interested in motor cars as well and supposedly invented a windshield wiper and, according to other sources, the car horn. In his honor, the Prinz-Heinrich-Fahrt (Prince Heinrich Tour) was established in 1908, like the earlier Kaiserpreis a precursor to the German Grand Prix. Henry and his brother William gave patronage to the Kaiserlicher Automobilclub (Imperial Automobile Club). Henry also was an early proponent of introducing submarines and airplanes. He had merchant ships converted into seaplane tenders for operations in the Baltic Sea. Henry respected his brother, but this attitude was not returned in the same measure. William kept his younger brother far from politics, although Henry served as his representative as long as the Crown Prince was still in his minority. Henry complied with this, for he did not interest himself in either politics or grand strategy. He did not recognize what political effect the German naval build-up would entail, and also would not have been in the position to move his brother toward a different policy. After the German Revolution, Henry lived with his family in Hemmelmark near Eckernförde, in Schleswig-Holstein. He continued with motor sports and sailing and even in old age was a very successful participant in regattas. He popularized the Prinz-Heinrich-Mütze ("Prince Henry cap"), which is still worn, especially by older sailors. In 1899, Henry received an honorary doctorate (Doctor of Engineering honoris causa) from the Technical University of Berlin. Also in foreign countries he received numerous similar honors, including an honorary doctorate (LL.D.) from Harvard University in March 1902, during his visit to the United States. Prince Henry died of throat cancer, as his father had, in Hemmelmark on 20 April 1929. George Burroughs Torrey painted a portrait of him. Royal Navy - Vice-Admiral (Honorary) 5 February 1901. Freedom of the City of New York, 25 February 1902, during his visit to the city. Freedom of the City of Philadelphia, 10 March 1902, during his visit to the city. Honorary doctorate (LL.D.) from Harvard University, 6 March 1902. ^ Regarding personal names: Prinz is a title, translated as Prince, not a first or middle name. The female form is Prinzessin. ^ "untitled". The Day Book. Chicago. June 13, 1914. p. 10. Retrieved August 20, 2014. Admiral Prince Henry of Prussia, brother of the kaiser, has invented and patented an electrical device for cleaning windows of automobiles in rainy or frosty weather. The device is set in operation by the pressing of a button. ^ a b "Latest intelligence - Prince Henry in America". The Times (36709). London. 7 March 1902. p. 3. ^ "Died". Time. 29 April 1929. Retrieved 2008-06-06. Prince Henry of Hohenzollern, 66, of Berlin, brother of onetime Kaiser Wilhelm II, Wartime commander of Germany's Baltic fleet; of heart disease and pneumonia; in Berlin. Popular Prince Henry visited the U. S. in 1884 and 1902, was caricatured in many a newspaper passing under festal arches of sausages, pretzels. ^ a b "No. 27365". The London Gazette. 15 October 1901. p. 6711. ^ "The Triple Alliance". The Times (36062). London. 10 February 1900. p. 7. ^ "No. 27281". The London Gazette. 5 February 1901. p. 766. ^ "Prince Henry in America". The Times (36701). London. 26 February 1902. p. 5. ^ "Latest intelligence - Prince Henry in America". The Times (36712). London. 11 March 1902. p. 5. Wikimedia Commons has media related to Prince Henry of Prussia (1862–1929). This page was last edited on 22 December 2018, at 03:27 (UTC).